One of the fastest ways to improve your writing skills is to free yourself from the most common English mistakes: things like exchanging less with fewer, misspelling its as it’s, or placing commas where they are not supposed to be. 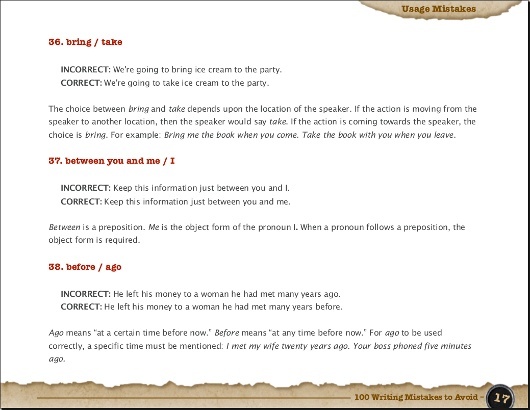 Thinking about this, a couple of months ago I had an idea: what if we could write an ebook with a compilation of the 100 most common writing mistakes of the English language? An ebook containing spelling, grammar, usage and punctuation mistakes, which would work as a quick guide for writers in a hurry who want to avoid such mistakes. Born in Chicago, Maeve has lived, studied, and taught English in the United States, France, and the U.K. Her educational qualifications include a B.A. (Hons) in English from the University of London, and a Ph.D. in Comparative Literature from the University of Arkansas at Fayetteville. She is also a published author of both fiction and non-fiction. I can’t wait until this comes out in book form. It will make a great gift for students! @Ms. B., we are working on it, and thanks for the encouragement! It *will* make a great gift! @Ms. B., fixed it for you. With all my respect… As I see these three examples 29, 30, 31 on the screenshot: Maybe these people should not write at all? just speak? or, even better, stay mum? @S. Blankstein, maybe they’ll get it right after reading the book 🙂 . great book, how soon will it be available in book form? @Anita, hopefully within a couple of months. @Tengku, we cover that in the book. would like to know from where can I get this book in India. @Sarika, currently only the digital version is available, so you’ll be able to download it from anywhere in the world. I’ve been sbcribing ur web for quite a while, glad u finally wrote a book. Would be very interesting. Would the hardcopy version be sold around Australia, say Perth? @Odjie, the hard copy version is not available yet. But when we release yes, it will be sold globally. Daniel I ordered to book 100 writing mistakes to avoid. Paid with pay pal. When I tried to get the book it said thank you for your order but you did not get the payment from pay pal yet. Click here if not received in so many seconds. I see now that the payment has come out of pay pal but I still can’t get the book. Please advise. Thanks. @Patricia, just send an email to danielATdailywritingtips.com and I’ll send you the book. I really hope I get my money on the paypal account soon that I can order it! I believe that proper use of the English language is important when you consider your market. Some people will not read your material or purchase if they find one spelling mistake (my wife is that way, that’s how I know this). But, when it comes to copywriting for sales, I look only at whether it entices more people to read, and whether they do what I want them to do . . . buy or signup for more. My wife, would rewrite everything I do, and used to, but as she rewrote . . . my sales went down. My skills with the technical aspects of the English language isn’t as good as my wife’s, but knowing what to say and how to say it even with a few mispelled words and improper use of language structure far outweighs the results I get when focusing on perfect English language. It all boils down to measuring what connects with your market and going with what works. Is the published book going to be different from the digital version? @Anoo, no, it is going to be the same thing. I love your work. Thanks so much! I just like to heard something on de use of “have” and “have got”. I have great difficulty in using or understanding the “Got” (passtence of Get of course) when used with “have”. 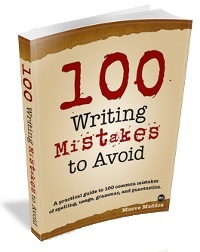 How do I purchase a paperback version of the “100 Writing Mistakes to Avoid”? @Sonja and Lynn, I am working to get the Kindle version done right now, and after that I’ll try to get the print one out there. Hopefully within a couple of months we’ll have it. After I printed out the book, I looked at it and wondered what in these 45 pages could be worth $10. Then, after I quizzed my self on the book’s content, then realized how many mistakes I make, I felt humbled and grateful. Great service. How do I obtain the paperback version of the “100 Writing Mistakes to Avoid”? @Lynn, we are working to get the paperback version out soon. yes, they are very different. Know it and then show it. and then you will show your professionalism. I am trying to buy the book. The link ‘add to cart’ will not activate. Don’t you sell outside the USA?? How do I obtain a paperback version, which I prefer? @Samuel, yes, you can buy it from anywhere in the world. Do you have any Affiliate program, i love to promote it thru my blog, leads and FB ads. Would you mind setting out other payment alternatives than paypal. In light of recent censorship by paypal, I’d hate to have to reopen my account there to buy your book. Is there a hard copy of the book out yet? I would love to have one of these. I’m still waffling about buying it, but I really really want it. The idea that I might be committing grammar crimes makes me feel all tingly inside knowing that even with my fancy education there’s still a lot to learn. I’ll probably ignore some of the grammar rules with the excuse of “but it sounds better!” but I want to KNOW which grammar rules I’m ignoring and why. Maybe hide a few in my emails to see if one of my grammar nut friends picks up on them. Hi and a Happy New Year! I am interested to have a copy of this book. May I know how much is this now? Received along with the first post, thank you. When will you sell the hard copy? Is it possible to get the book using money order? I can’t spell or punctuate (C student) but do close large deals all the time. You teach English but can’t close a $10 book sale. Hmmm? Please let me know when your master card works. When can I buy the paperback version of this book? Your prompt answer would be highly appreciated. I’m in the process of ordering your publication “100 Writing Mistakes To Avod”, however PayPal is a problem. I have a PayPal account funded by a credit card already established. I seldom us it,but have it. I logged on and tried to purchase the above. PayPal said had to verify the credit card (now I’ve had the **** thing 35 yrs so should not have to verify again). I put in the information and was advised PayPal would charge the account $1.95 to verify and with that charge there would be a 4 digit code to use on the PayPal order page, blah, blah, blah. Well, none of this sounded right so I called them. Young man says I much check credit card statement for 4 digit code. With him still on the line I logon to the credit card site. The $1.95 charge is there (all under pending charges) with no code in sight. So I either have to use another card (how long to verify that one?) or wait 2 days to see if the code appears on credit card statement. A lot of time spent to purchase your publication. I may try again because I’d like to have it, but I may not too.